Grasses, long ignored as ornamentals, are now enjoying a growing popularity, especially with the increase in dry gardening techniques. 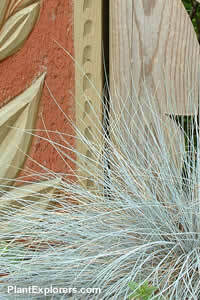 Blue Fescue is the perfect addition to any modern garden, by virtue of its tidy form and remarkable colour. For maximum freshness, please keep seed refrigerated in its original packaging until it is time to plant. Sow seed in containers in a coldframe in spring or autumn. Seed may be sown <i><b>in situ</b></i>, but there is always the problem with birds eating the seeds before they grow. Grow in poor to moderately-fertile, dry, well-drained soil in full sun. Divide and replant every 2 or 3 years to maintain foliage colour.